Cedarville senior guard Maggie Coe (30) puts up a shot while surrounded by four Greeneview Rams, during the first half of Thursday’s Dec. 21 Ohio Heritage Conference girls high school basketball game in Cedarville. Coe led the victorious Indians with a game-high 21 points scored. Greeneview’s Frankie Fife (12) goes up for a first-half score, Dec. 21 at Cedarville High. Fife led the Rams with 13 points in a 51-44 loss. 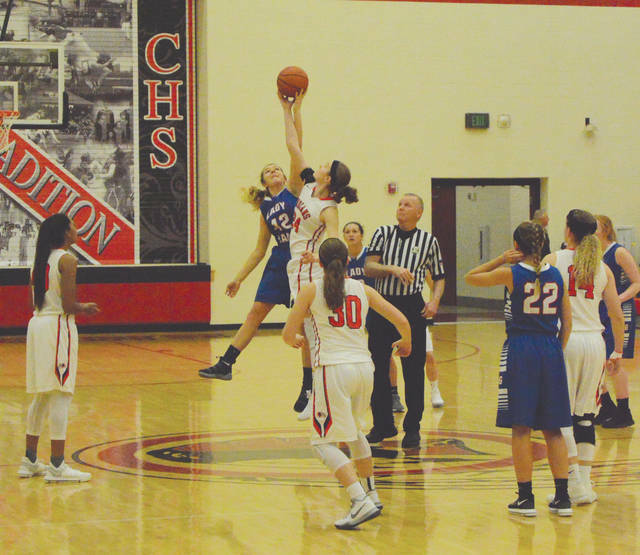 Greeenview’s Ashley Schloss (42) leaps with Cedarville’s Kaylee Cyphers (24) for the opening tip-off in Thursday’s Dec. 21 girls high school basketball game at Cedarville High School. Cedarville’s Celeste Rucker (40) leans into a jump shot during the first half of Thursday’s Dec. 21 battle for the Ohio Heritage Conference South Division lead. Host Cedarville won the game, 51-44. 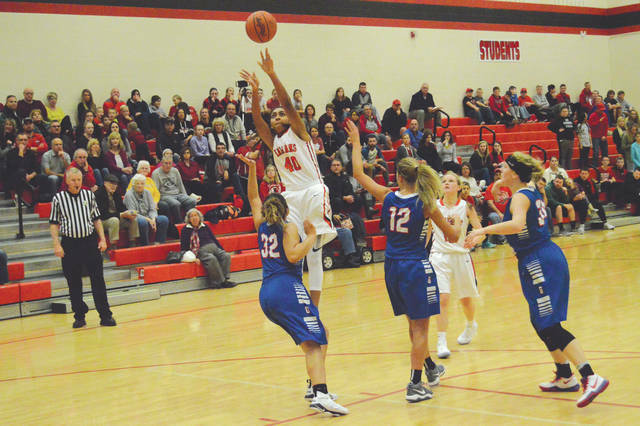 CEDARVILLE — In a rowdy gymnasium, the host Cedarville Indians played like they were in a playoff game, and they beat a playoff-caliber opponent in Greeneview, Thursday Dec. 21 at Cedarville High. Junior guard Maggie Coe scored from the left baseline to put the Indians ahead 4-2 with 4:30 left in the opening quarter. As it would turn out, Cedarville never gave up the lead from then on. 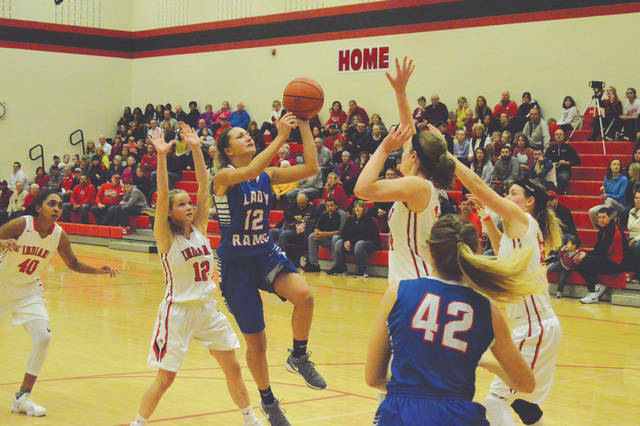 With scores by Coe and senior teammate Ise Bolender, the Indians charged out to a 14-4 lead after the first quarter of play. And every time Greeneview would mount some sort of a rally to get back in the game, Cedarville would respond with a key score of its own. 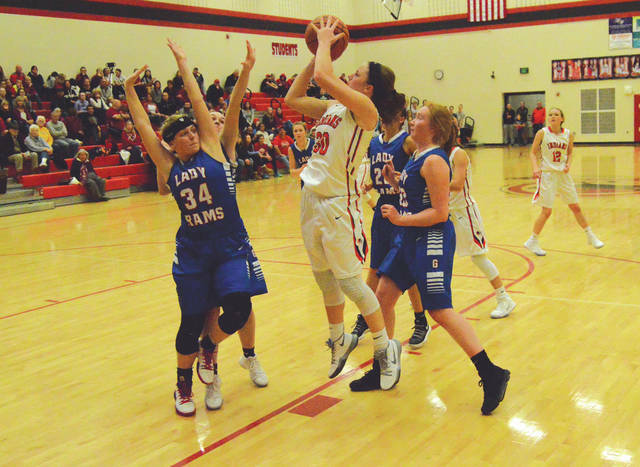 The visiting Rams pulled to within 13-15 when Gabby Boyer scored from inside with 4:45 to play in the third, but that’s as close as Greeneview would get the rest of the way. Greeneview’s final time of being within range of tying the Indians came late in the third quarter. Trailing 26-29 after Frankie Fife drained a 3-pointer from the top of the arc, Bolender responded seconds later with a steal and a score to put Cedarville up 31-26 after three quarters of play. In the game’s final four minutes, Cedarville’s Bolender, Coe and Ruby Stack combined to hit 10-of-12 free throws to seal the win. Coe finished with a game-high 21 points scored, Bolender knocked in 16 while Stack and four other Indians combined for the other 11 points, to give Cedarville sole possession of first place in the Ohio Heritage Conference’s South Division with a 6-1, 5-0 record. Fife led Greeneview (5-1, 4-1 OHC South) with 13 points with Sylvie Sonneman next with eight, and Boyer finished with seven. Cedarville coach Josh Mason was glad that the two teams got to play in a rowdy atmosphere, with fans screaming for both teams throughout the contest. “I was telling (Greeneview coach Tim Hoelle) before the game. I love it when girls can play in an atmosphere like this. … I told the girls before the tip-off just to soak this in. The atmosphere and a rowdy crowd, that’s what high school sports are all about. Greeneview will host a McDonald’s holiday tournament for its next game. That is set to be held Wednesday, Dec. 27 in the Rams’ home gym. Cedarville has another day to wait until the Indians are back in action. They head south to take on Monroe for a game on Dec. 28.